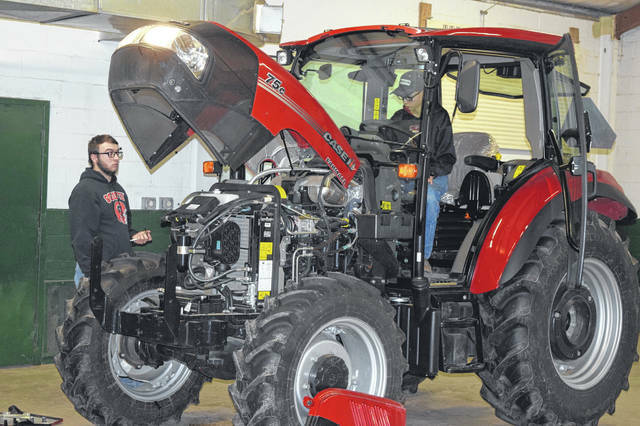 The District Five Agriculture Industrial Diagnostics Contest, also known as Tractor Troubleshooting, was held in the Bruner Building on Friday, Feb. 8. All District Five schools participated, with teams consisting of two students. 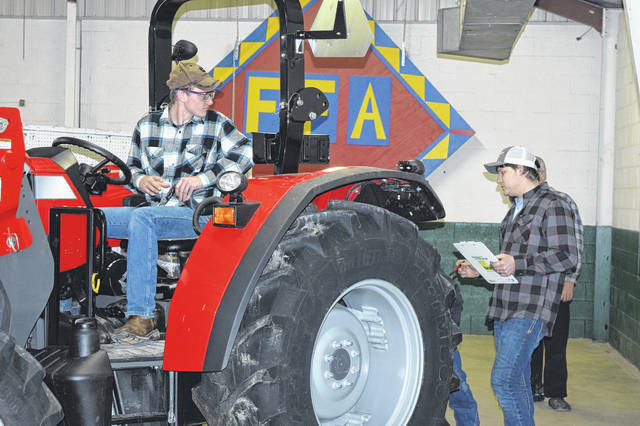 EATON — The District Five Agriculture Industrial Diagnostics Contest, also known as Tractor Troubleshooting, was held at the Preble County Fairgrounds’ Bruner Building on Friday, Feb. 8. All District Five schools participated, with teams consisting of two students. The students have 20 minutes to diagnose two issues with the tractor and to get the tractor running. In addition to fixing the tractor, they must explain to the technician what was wrong, how to fix it, and give them customer relation information. The students are judged on their technical skills, the equipment used, safety practices, and communication skills. The students who compete have to score on knowledge scores and show knowledge tests, as far as what they are working with. They have to demonstrate the skills and know how to do it. According to National Trail Miami Valley Career Technical Center (MVCTC) FFA Advisor Eric Kennel, each team spends several hours practicing after school to prepare for the competition. Community members and various technicians volunteer their time to help the students prepare. They create a malfunction and then teach the students skills needed to fix that problem. For Kennel, this is another opportunity to teach students valuable skills. “It teaches them responsibility, problem solving, and how to communicate. It also gives them hands on experience with ag equipment and real life situations they are going to run into — it helps to prepare them for a career,” Kennel said. Kennel also thanked the various dealerships who helped them organize and prepare for the competition: Steinke Tractor, Bane Welker, Zimmer Tractor, and Koenig Equipment. He also thanked the Preble County Fairgrounds for the use of the Bruner Building. 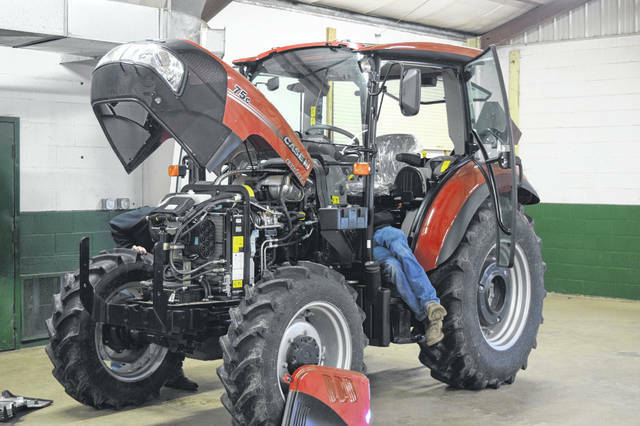 https://www.registerherald.com/wp-content/uploads/sites/41/2019/02/web1_Tractor2.jpgThe District Five Agriculture Industrial Diagnostics Contest, also known as Tractor Troubleshooting, was held in the Bruner Building on Friday, Feb. 8. All District Five schools participated, with teams consisting of two students.